You work so hard to get people to your site. You spend hard-earned dollars on marketing, invest your precious time on social media, and send emails to your hard-won list. They finally add something to their cart. Maybe they even make it to the checkout page. Shopping cart abandonment is a huge problem for online stores. I mean, the average cart abandonment rate hovers around 70%. What can you do, as a store owner, to stop people from leaving without buying? Research by Business Insider indicates that there could be up to $4 trillion dollars in merchandise just waiting to be recovered in abandoned shopping carts. With the right tactics (which we’ll teach you), you could recover up to 64% of that. Before you can do that, however, you must first understand why people leave. First, think about the people who visit your site. Some are random, some came from paid ads, and some are from social media. Just because they landed on your store on purpose, however, doesn’t mean they’ll buy. But those people who add something to their cart and reach the checkout? They’re motivated. The vast majority (61%) felt the extra costs of shipping, tax, and fees were too high. Think about it - when was the last time you went to buy what you thought was a great deal, only to be hit with a shipping cost just as high as the price of the item? On top of that, we see reasons like not wanting to create an account, a long or complicated checkout process, and being unable to see the total order cost up-front. According to psychology, we prefer known unknowns over unknown unknowns. Or, put more simply, we like to know what we’re getting into. Many of the tactics you’re about to learn all lead back to the same thing: Being straight-up with your customers and reducing friction leading to checkout. When it comes to optimizing pages, you want the most bang for your buck, right? Well, plenty of people might add something to their cart. Some of those people will make it to the checkout page. Very few, however, will actually purchase. Of 419 visitors who added an item to their cart, only 192 reached the checkout page and just 47 people purchased. Somewhere along the way, we lost 372 potential sales. Yikes! This is why you should prioritize optimizing your checkout page over the rest of your site - it’s where you lose the most conversions. How do you optimize your checkout page? Allow your visitors to checkout as a guest without creating an account to reduce friction. Show trust badges, such as McAfee Secure, to reduce fear and build trust. Display cart details throughout your store to reinforce the benefits (more on this later). Ensure your design is friendly, attractive and simple to further build trust (see below). Don’t forget the number one reason people don’t buy: Extra costs are too high. You don’t want to surprise your visitors with a massive shipping cost, ever. Instead, show them the shipping costs starting on the homepage and throughout your store. In fact, if you have a set rate (like $10 shipping for all orders over $20 or free shipping over $50, for example), display that prominently on your site. What should you do if you have a really high shipping cost? If you have a really high shipping cost and don’t want to display it for fear of scaring visitors away, there is a tactic you can use! Build the shipping cost into your item cost. Upping the price of an item in your store and providing a lower shipping rate for your customers can potentially increase conversions. One final tip: Try to offer free shipping, if possible. According to the E-tailing Group, 73% of surveyed individuals mentioned that free shipping is absolutely necessary when it comes to making an online purchase. Just as you shouldn’t surprise customers with high shipping rates, you shouldn’t surprise them with massive fees, either. The biggest surprise fee is taxes. While everyone knows intuitively that they’ll probably need to pay taxes on an item, the actual sum might surprise us. Despite knowing we need to pay it, we still sometimes don’t expect it. The easiest fix for this problem? Install a sales tax calculator. If you can’t do that, then just include a sentence in your product description stating that tax will be calculated at checkout to give people a reminder. Customer service is your secret weapon. For you Harry Potter fans, it’s like the sword of Gryffindor - It comes out just in time to give you an edge (pun totally intended) over your competition. A 2013 study by customer service software Groove asked 1,500+ companies what channel they’re investing the most in. Of the 7% of respondents who answered “Customer Service”, their conversions were an average of 11% higher than everyone else in the study. 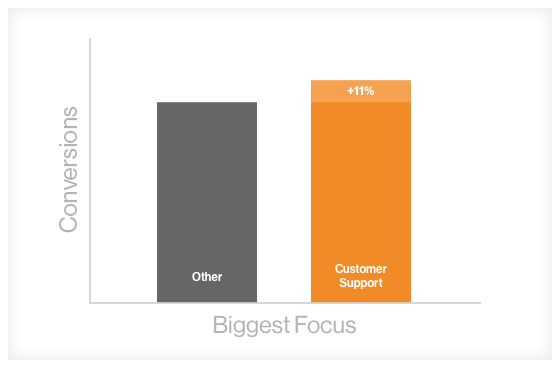 While it’s sad that only 7% were investing in their customer service, the numbers don’t lie. 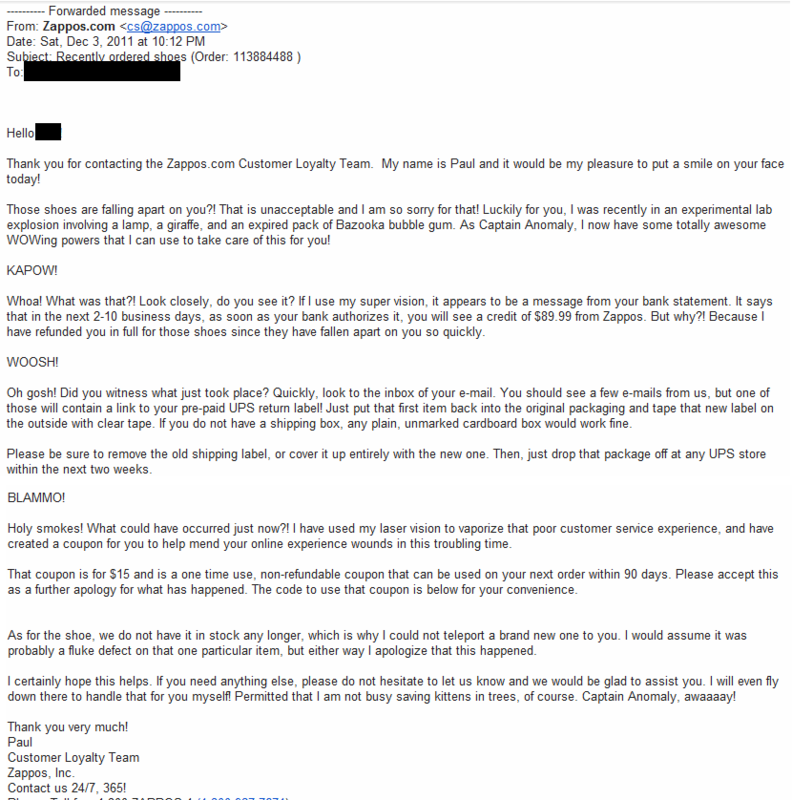 Just look at Zappos - their core competency is their customer service and they’ve become the biggest shoe retailer of all time. And they have a hell of a good time doing it. That looks like fun for the service rep and the customer alike! Want more inspiration? Check out these excellent examples of customer service. You should have seen this one coming after the chart in the first section. 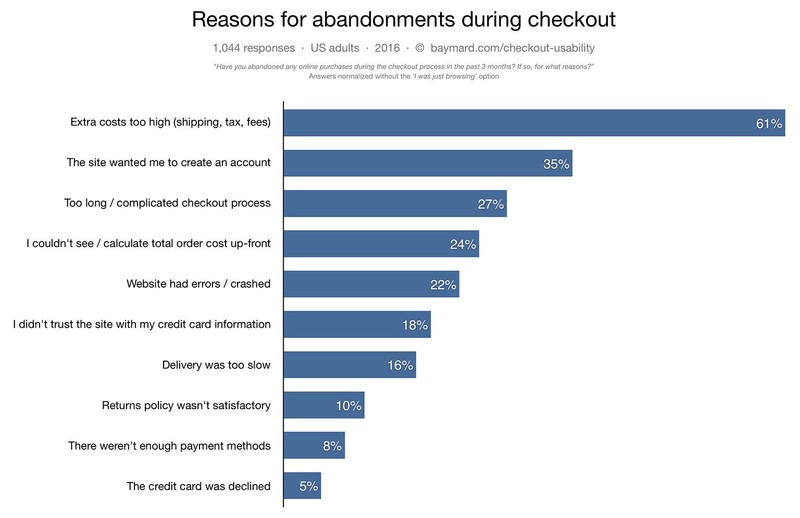 It’s the second highest reason people abandoned cart, at 27% of respondents. The longer it takes for your customers to purchase a product, the lower the chance they’ll follow through. So how do you shorten the checkout process? Offer one-click checkout, similar to Amazon. Only ask for essential information. Put all the checkout info on one page (i.e. shipping, billing, and payment info). If you can’t put it all on one page, include a progress bar to keep customers in the know. Roughly 18% of people abandoned their cart due to trust issues. Meaning they didn’t trust the site with their credit card information. 1. Display security badges on your site. 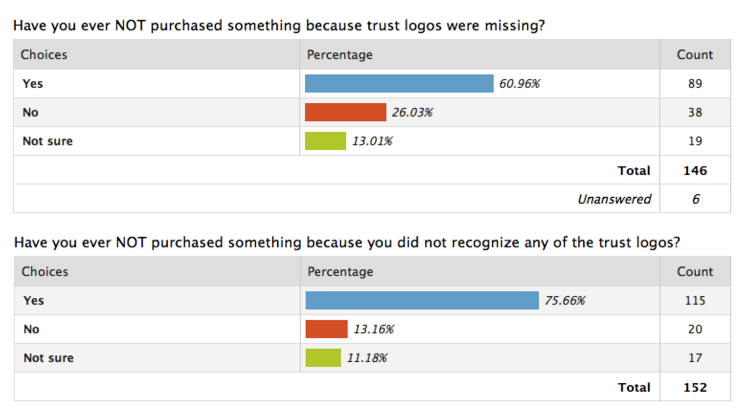 Data cited by Shopify indicates that almost 61% of consumers had not purchased something online because trust logos were missing, but also that more than 75% of consumers had chosen against making a purchase because they didn’t recognize the trust logos. What does that mean? Simple, really - only use well-known security badges, like PayPal, McAfee, and Norton. 2. Build an amazing “about” page. A brand’s about page is often overlooked… an afterthought when building their site. However, neglecting your about page is like installing a pipe with a leak - some water (aka your traffic) will drain out without being captured. Customers want to buy from companies with meaning and a compelling story. So, be personable. Show your picture and tell your personal story. Include your team as well. Talk about why you opened your business and your goals. If you want more tips, Shopify wrote a nice guide to creating a great about page. 3. Offer multiple payment options. Giving your customers a choice of which payment option to use increases trust - particularly if you offer PayPal. PayPal backs up it’s users purchases with a guarantee, so people will be more willing to purchase a product if PayPal is an option. 4. Capture and display online reviews. Reviews are another topic I could write a whole post on (and very well may). They’re so important. Why? Because 88% of consumers say that they trust online reviews as much as personal recommendations. Want another reason? Customers spend 31% more with a business that has “excellent” reviews. If you’re ready to get serious about customer reviews, our partners YotPo wrote a comprehensive guide on how to get more reviews. When people shop online, it’s typically the same as how they shop in-store (for the most part): Random and erratic. They might bounce around from item to item and category to category, checking out things they might want. Just as some big box retailers offer multiple checkout locations near exits to the store for customer convenience, so too should you make it convenient for your shoppers to quickly checkout. They literally say, “We’re gonna get you out of here real quick”. While I don’t necessarily recommend saying that, two things I like about this feature are the “extra goodies” to increase average cart size and the phone number in the top right to build trust. 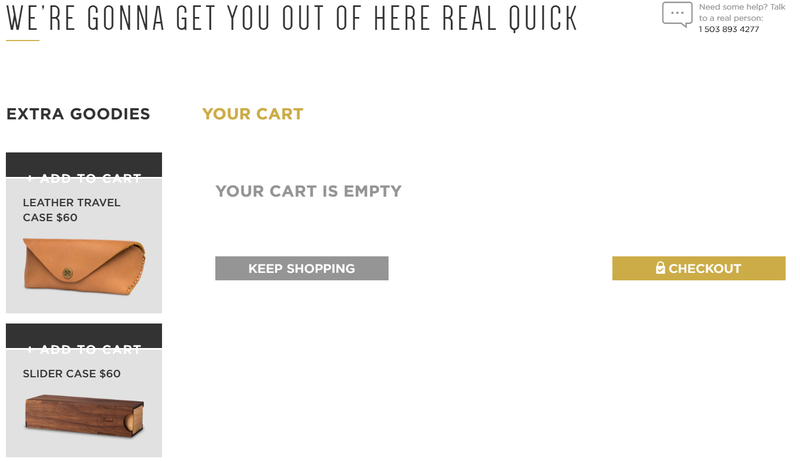 Another thing you can do to make the checkout process easier is to have a popup like the one below come up after a visitor adds something to their cart. That way, they can choose whether they want to checkout or continue shopping. The majority of people took more than a day, with many taking more than three days and even more than a week to finish their purchase! You need to offer saved carts. That’s where cookies come in. You can install a cookie on your site that allows visitors to save their cart for a certain length of time - preferably at least 60 days, as the buyer’s journey could take that long. For example, you can have a user create an account by entering nothing more than their email. Then, generate them a password and send them an email to activate their account using that password. Note: Don’t make them create an account in order to purchase. When they enter their email to purchase, send a link to create an account in the email. Finally, incentivize this action beyond simply saving their cart by offering them loyalty rewards points or a discount on their first order. Email recovery simply means sending a cart abandonment email asking the user to finish their purchase. And guess what? They work. Over a tenth (11.6%) of all cart abandonment emails are clicked. 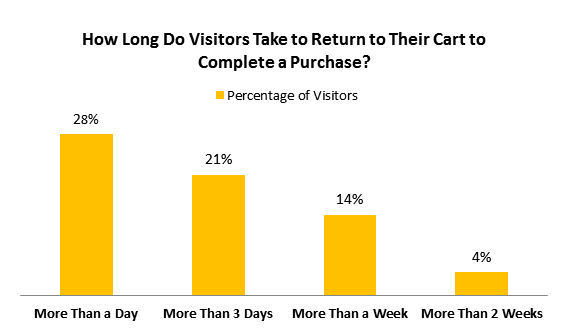 Just under a third (29.9%) of clicks lead to a recovered purchase back on site. The AOV of recovered purchases is 14.2% higher than typical purchases. Sending an email followup isn’t hard either. You can use a tool like Conversio (they’re awesome, by the way) to easily send beautiful recovery emails. It has all the right things… great copy, a pinch of wit, some fun elements, and a large call-to-action (CTA) button. 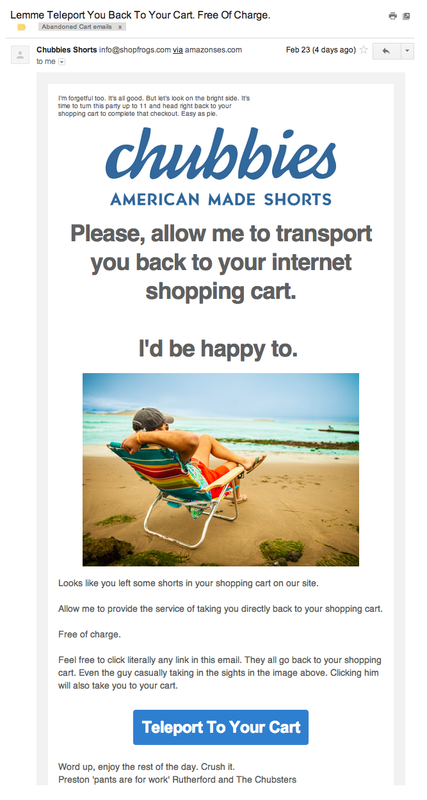 This is just one of 13 amazing abandoned cart emails Shopify talks about - go check ‘em out! Quick, invest all your money in X stock before they go up! Hurry, only 10 items left in stock, buy now! Act now before it’s too late! Urgency works incredibly well to get people to commit to making a purchase for many reasons. For one, fear of missing out (FOMO) is a real thing. For two, people place a higher value on scarce resources. In fact, I’ll bet even reading the words “quick” and “hurry” made your brain slightly more alert. The very words have urgency built into them… and it’s wired into our brains. So, how can you leverage the incredible power of urgency? Display how many items you have left in stock - especially if it’s fewer than 10. Offer a discount, but only to the first X buyers. Link your products with an event, like Christmas or a person’s upcoming wedding. Just be sure to remind them with an email as the event gets closer! Add a checkout reservation timer (here's a Shopify app for that). 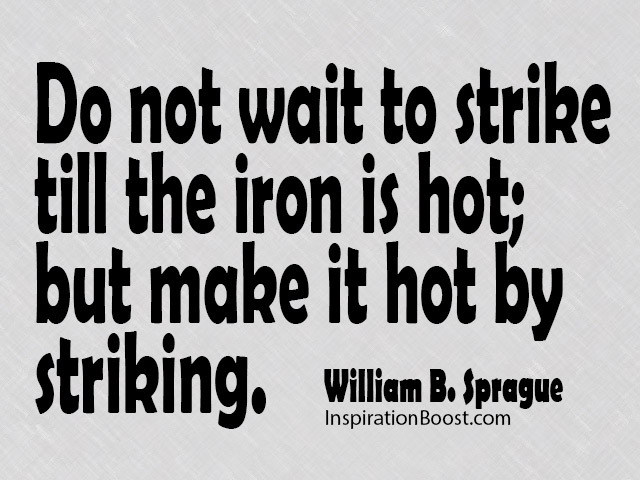 Urgency isn’t hard to pull off, but make sure you’re honest. I’m not suggesting you lie about the number of products you have or when a sale ends. Your eCommerce returns policy can increase sales. Sounds counter-intuitive, doesn’t it? How would easier returns (which reduce profit) lead to increased sales? Check this out: 91% of people say a store’s refund policy is factored in their purchasing decision. That’s right - 9 out of 10 people look at the refund policy before making a purchase. Offer tiers of return policies. For example, offer a full return if a product is unopened and 75% (or whatever you want) if it was opened. Make it as painless as possible. Give them a label they can print, slap on a box, and send out. Don’t require the original receipt. The less effort it takes, the happier your customer will be. Remember: Happy customers mean loyal customers. Offer a cash refund, if possible. While I see the benefit of offering store credit (as it keeps their business with you), it’s much better to not force that upon the customer. Amazon does store credit, but I don’t mind that because you can buy nearly anything there. Unless you're like Amazon, just give them cash back. If you’re keen on learning more, check out our recent webinar on how your return policy can increase sales, and if you're looking for a Shopify app to manage returns, checkout Returns Manager. Reducing your cart abandonment rate isn’t rocket science. You don’t have to have a PhD in conversion optimization or use any slimy sales tactics. I challenge you to take 10 minutes, right now, to go implement one of these tactics. And bookmark this page so you can come back and do the others later. P.S. We want to hear your stories! Whether you were able to recover just one abandoned cart or a hundred, we want to hear about it. Drop a comment to tell us how your store is doing and your favorite sales tactics! 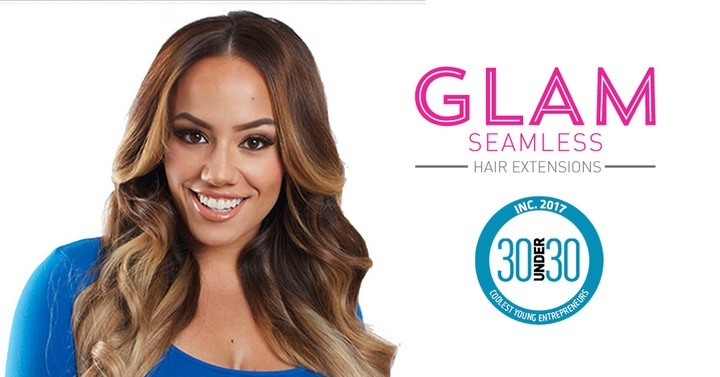 Celebrating our client Glam Seamless on making Inc's "Top 30 Under 30"